Kuan Yin Statues can be made of different materials, such as wood, metal, porcelain, resin, and stone. 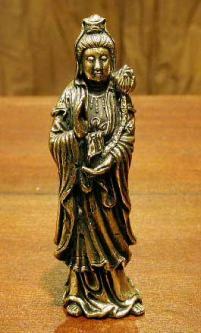 Generally metal statues of Kuan Yin are made of bronze and have a deep patina, giving them an antique look. Brass and bronze allow for greater statue details. And wood Kuan Yin statues are carved by hand and have a soft appearance; they would make a great feng shui statue. But the most popular are the Black Stone Kuan Yin statues, which are popular as both indoor and outdoor statues. Many people ask about the correct spelling of Kuan Yin, and we have to admit we have seen it spelled as Kwan Yin (with a W instead of a U) or as Quan Yin, but either way she is known as the Goddess of Compassion, and she is one of the most popular goddesses in Asia. We have more information about the Buddha Kuan Yin below. What Does Kuan Yin's Name Mean? Her name is usually translated as The One who Hears the Cries of the World. She has a counterpart in Tibetan Buddhism known commonly as Avalokiteswara, even though that Bodhisattva is a male, while Kuan Yin is a female. Compassion is what people call upon Kuan Yin for, and she dispenses it through the vase that she is seen holding in most statues. Kuan Yin is also a patron saint of Sailors, so she might be seen on a lotus blossom (or tortoise) that is floating upon waves. She is also called upon by women (and men) who are childless. You may have already seen statues of her holding a baby, which are said to help fertility. Aside from the vase, she will sit upon a lotus blossom to symbolize purity. She is seen as having a thousand arms (so that she can reach out and help all corners of the world). In the palm of each hand, she will have an eye, which helps Kuan Yin look for souls who may be in trouble. The Statues may be placed indoors and out, but should not be placed in low areas, such as bathrooms. If outdoors, near a willow tree would be an ideal location to place your statue. Incense is usually offered to statues of Kuan Yin. In Thailand, where I am from, we don't use the phrase Kuan Yin Temple, but instead say Saan Jao, so it means more like a Shrine to Kuan Yin. You may know that some statues of the Bodhisattva Kuan Yin are hollow, and allow you to pour water into the Dragons' mouths at the base of the statue. Then you tilt the statue upside-down, and the water flows out of the vase Kuan Yin is holding. There are many legends about the origin of Kuan Yin, but the one I like best also happens to be one of the most popular. In 7th century China, a king had three daughters, the youngest named Miao-Shan. At the time of Miao-Shan's birth, the earth trembled and a wonderful fragrance and flower blossoms sprang up around the land. Many of the local people said they saw the signs of a holy incarnation on her body. While the king and queen were amazed by this blessing, they were unfortunately corrupt, and they saw little value in having a child who appeared pure and kind. When Miao-Shan got older, the king wanted to find a husband for her. But she told her father she would only marry someone if by so doing she would help alleviate the suffering of all mankind. The king became enraged when he heard of her devotion to helping others, and forced her to slave away at menial tasks. Her mother, the queen, and her two sisters admonished her, all to no avail. In desperation, the king decided to let her pursue her religious calling at a monastery, but ordered the nuns there to treat her so badly she would change her mind. She was forced to collect wood and water, and run the garden for the kitchen. They thought this would be nearly impossible, since the land around the monastery was barren. To everyone's amazement, the garden flourished even in winter, and a spring welled up out of nowhere next to the kitchen. When the king heard about these miracles, he decided that he was going to kill Miao-Shan and the nuns who were supposed to have tormented her. But as his henchmen arrived at the monastery, a spirit came out of a fog of clouds and carried her away to safety on a remote island. She lived there on her own for many years, pursuing a life of of religious dedication. Several years later, her father, the king, became seriously ill. He was unable to sleep or eat, and his doctors believed he would certainly die soon. As he was about to pass on, a monk came to visit the king. The monk told the king he could cure the monarch, but he would have to grind up the arms and eyes of one free from hatred to make the medicine. The king thought this was impossible, but the monk assured him that there was a Bodhisattva living in the king's domain who would gladly surrender those items if asked. The king sent an envoy to find this unknown bodhisattva. When the envoy made his request, Miao-Shan gladly cut out her eyes and severed her arms. The envoy returned, the monk made the medicine, and the king instantly recovered. When the king thanked the monk, the monk admonished him. "You should thank the one who gave their eyes and arms." Suddenly, the monk disappeared. The king believed this was divine intervention, and after ordering a coach prepared, headed off with his family to find and thank the unknown bodhisattva. When the royal family arrived, they realized it is was their daughter Miao-Shan who had made the sacrifice. Miao-Shan spoke up, "Mindful of my father's love, I have repaid him with my eyes and arms." With eyes full of tears and hearts full of shame, the family gathered to hug Miao-Shan. As they did, auspicious clouds formed around Miao-Shan. The earth trembled, flowers rained down, and a holy manifestation of the Thousand Eyes and Thousand Arms appeared hovering in the air. And then, the bodhisattva was gone. To honor Miao-Shan, the royal family built a shrine on the spot, which is known as Fragrant Mountain.